Andy Murray challenged Tim Henmann to find and play tennis on the most remote court in Britain. In a beautiful setting overlooking the Atlantic ocean on the road to Husinish on North Harris, the court at Bunabhainneadar* offers a top class artificial grass surface and a cosy wooden pavilion (in case it rains!). 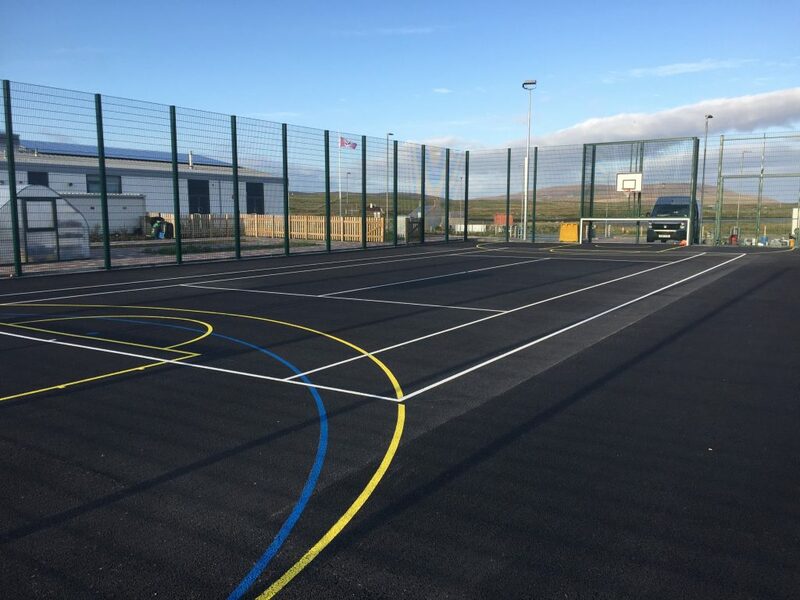 ColourWorks have painted some Sports Lines on the MUGA (Multi Use Games Area) at the recently completed North Uist Primary School on the Outer Hebrides. We travelled to Lochmaddy on North Uist by Ferry from Uig on Skye. 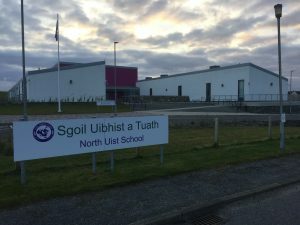 The new Primary School is situated further inland at Bayhead. 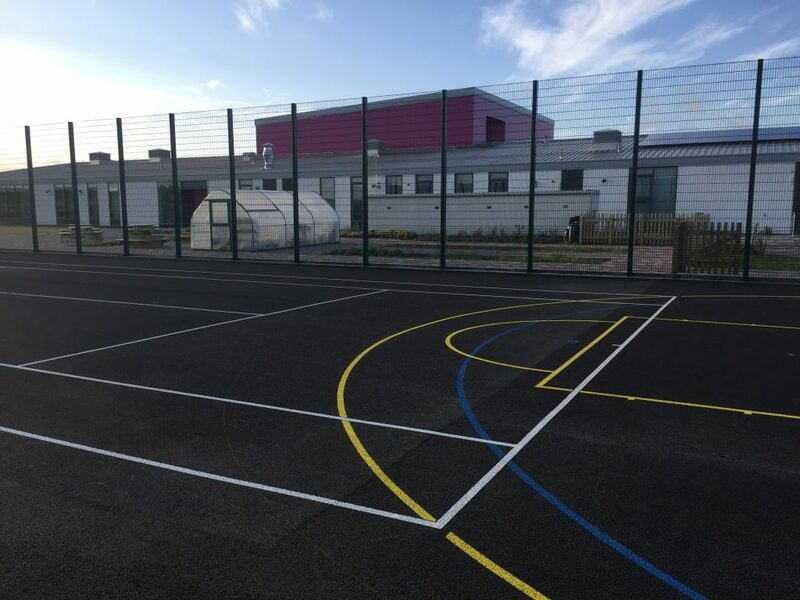 The lines on the new Porous Macadam MUGA included a set of Tennis Lines. Therefore, we are now claiming that this is “Furthest West” Tennis Court in Scotland ! Weather conditions certainly proved challenging and lived up to the old adage about the weather on the Western Isles…. North Uist is in the centre of the group of Islands known as the Outer Hebrides, or Western Isles. The Hebrides are known as the “long island” as they stretch for 100 miles. The Outer Hebrides consist of the Isles of Lewis, Harris, Scalpay, Beneray, North Uist, Benbecula, South Uist, Eriskay, Barra and Vatersay. North Uist is a landscape of fresh and salt water lochs bordered on its western side by miles of sandy beaches, and cultivated crofts. North Uist is very popular with walkers, bird watchers, motor homers and cyclists alike. On the west side of the island the road follows the machair, (the fertile coastal grassland bordering the sand dunes), whilst the eastern side is mainly water. This area is a fisherman’s and bird watchers paradise. The island is connected by causeway to Benbecula, Berneray and Baleshare. Lochmaddy is the main town and fishing port on the island and has a population of approximately 300 people. North Uist can be reached by ferry from Uig on Skye to Lochmaddy or by the smaller ferry which weaves its way through the small islets of the Sound of Harris between Leverburgh on Harris to Berneray, connected by causeway to North Uist.